I've been thinking about penguins lately. Professional reasons. There comes a point in a guy's life when he is paid to think about penguins. Here's what I've learned so far: We've seen so many hyper-stylized cartoon penguins that we've grown used to the stylization. In fact, we've grown so used to it that when someone slams our eyeballs with a picture of a real penguin, our first reaction is: "No. Not right. That's not a penguin." See? Real penguins aren't round. They have really bendy necks. They have long, pointy beaks. They have small heads and really small eyes. They have tails. And most of them aren't black-and-white. Also, baby penguins are fuzzy. In short: Real penguins are nothing like the penguins skittering around in our collective visual imagination. Real penguins look wrong. Isn't it strange that our minds have come to prefer the lies told to us by cartoonists? Doesn't this odd fact tell us something massive and disturbing about the power of popular culture? For example, how did the "cartoon Russians" of our Cold War imaginations compare to actual Russians? 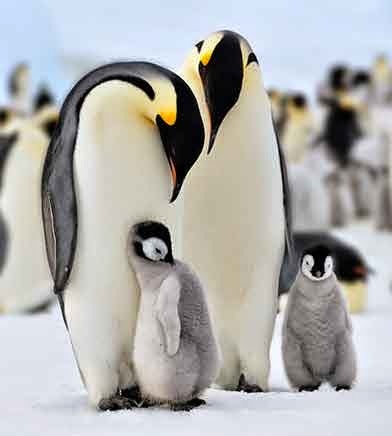 Yes, I have finally managed to politicize a trivial Sunday post about penguins. Please share with the rest of the class if you have any thoughts about penguins -- or about the deceptive treasure house of imagery we carry around in our unconscious. Or unconsciouses. Or should that be "unconsciousnesses"? What is the plural of that word? Is there a plural? We like our cartoon characters to be cute. Humans are hardwired to like cute. Cuteness pushes our button. It triggers nurturing behavior. It makes us more attentive towards babies and children. This promotes the survival of our offspring. Babies are cute. Looking like a child makes cute. Proportionally large head to body makes cute. Large eyes and high forehead make cute. We love bunnies, puppies, and kittens. They’re cute. Long lanky adult dogs with long necks and muzzles, and low sloping foreheads aren’t very cute. Adult jackrabbits aren’t cute. Children with more adult facial features such as a low forehead are more likely to be subject to abuse. The development of individual cartoon characters has shown a trend towards expressing juvenile features. In Biology this would be called juvenilization or paedomorphism. The retention of juvenile features is neotony. Evolutionarily, modern humans are thought to be neotonous apes. We’re walking talking fetuses. But I digress. With cartoon characters from the golden age of animation, doofuses and nutcases were drawn with long necks and low sloping foreheads. Some of our popular beloved cartoon characters began their careers as nutcases. Bugs Bunny, Daffy Duck, and Donald Duck in their earliest performances had a tendency to slip into bouts of psychotic crazed behavior… almost frightening actually. And in their early incarnations all these characters had long necks and low sloping foreheads. Woody Woodpecker may be the best example of this. The guy had a long neck, low small braincase, and a wicked long beak. But like all the other cartoon favorites, Woody ended his career well behaved and sported a juvenile appearance with short legs, proportionally big eyes, and a high forehead. Evidently, audiences were put off by the insane antics of many cartoon favorites and the animators began to soften the hard edges in response to make the characters more loveable. Even Popeye went through this transformation for chrisakes. Maybe rounder features were easier to draw. Animators often used coins to trace the circles that cartoon bodies were based upon, but the animated behavior transitioned to softer edges also. So it wasn’t just the pencil work. Early animation was shown in theaters to mostly adults. Could be that as cartoons became more oriented towards younger audiences the gentler cuter characters were thought more appropriate. And really, the earliest Woody Woodpecker and Daffy Duck can be unnerving to watch, they’re so batshit crazy. Evolutionary biologist, Stephen Jay Gould wrote a remarkable essay on this; A Biological Homage To Mickey Mouse. Do a web search on “neotony, Mickey Mouse”. Hardly unique to Penguins. Hearts don't look like cartoon hearts, and don't beat out of people's chests. Mice don't look like Mickey, in colour or shape. That piece of music you talk about is okay. I prefer Saint Saens. Prokofiev. Sibelius. Dvorak. Last Night of the Proms stuff. I really prefer renaissance music. Watkin's Ale, Packington's Pound, that sort of thing. Why is Carmen the only Bizet work that people know? For the same reason that "Cars" is the only Gary Numan song that most people know. The media gatekeepers said, "people like this, play it to death." And an obedient public did what they were told, whether they knew it or not. Interesting answer, Seth. But I'm not sure that I feel comfortable always blaming a vague, inchoate "Them" (which is what your remark about "media gatekeepers" comes to). It might be bolder and more honest to come up with a scenario in which the guilty party is Us, as in all of us. It isn't easy to say "X is really good!" when you're the only one who knows what X is. We feel more comfortable when we know we're going along with a crowd. Also, "Carmen" is popular because at one point or another, most guys meet up with a woman who is pure Trouble. Those of us who grew up on old cartoons in the days of B&W TV remember the caricature of the bomb-throwing anarchist--bearded, wild-eyed, and throwing a black bowling-ball bomb. For a later generation this image of the terrorist is, I suppose, a bearded Islamic man. I wonder, are kids' books still claiming that railroad trains go "choo choo" and have smokestacks and cowcatchers? There's a bit of cognitive dissonance for young minds, if they are. Those penguins looked right to me, but I have seen a lot of Antarctica (and other penguin habitats) documentaries. As far as I know the only cartoon penguin I have seen is Tux, the Linux mascot, and I have not seen that in years. I have seen Beastie, a cartoon Satan, who looks nothing like the real devil, whom I saw recently when he told me he created the Safari web browser. Big Eyes are essential to almost all characterizations of anything we are supposed to feel empathy towards. Even actors will have their top lids raised to make their eyes look more round, visible, and as a result, more emotive. Are you considering opening up an eye enhancement shop in Alaska for penguins? "Big Eyes are essential to almost all characterizations of anything we are supposed to feel empathy towards." In old Paris the prostitutes used eye drops of belladonna extract to dilate their pupils, which gave the illusion they felt empathy towards their customers. We humans have even bred our pet varieties to have short muzzles and big eyes. Gives them all sorts of breathing problems and has created cats that look like owls staring at you. I think that for political propaganda purposes we don't use cute animals so much as spokespersons who emulate trusted parental figures. Even the great subterranean cathedrals of Lallibella, a quite different artistic tradition, gives the figures bizarrely huge eyes. Also, perfectly round. I'm not sure how emotive a perfect circle can be. I disagree with CBarr's statement that a high forehead denotes cuteness, though. John Buchan always listed a short brow as a sign of beauty in a woman. Of course he also thought it was a compliment to say that a woman reminded him of a young boy. A cute woman and the cuteness of a small child are not one and the same. Neither are the emotions triggered by the sight of each. CBarr, there is some similarity some times between the cuteness of some young women and children. Consider the success of the Ditzy Blonde syndrome in attracting men--so much that perfectly capable women feign ditziness as a social ploy. One observer suggested that it was attractive because it suggested to men that the ditzes could be easily manipulated into bed. Maybe so--for some men. I gave the matter some thought and considered that the ditz might get advantages because she would then encourage young men to approach her who without the ditziness would otherwise be intimidated by her beauty. She also inspires a desire to protect and nurture on the part of both young men and older, with the attentions and favors sublimated as charity. So I think a child-like impracticality and a certain helplessness (and big round eyes) can be attractive in certain women and needn't be associated with urges toward the too-young. Of course, in these competitive times, impractical women can be expensive, however attractive. Anonymous; I was rethinking what I'd said earlier in response to Stephen and logged on again to find your comment. Yes, there is definitely some overlap between the two. A woman convincing a man that he should nurture and protect her is obviously to her advantage. And natural selection works effectively by making use of already existing genes and coopting them for other purposes. If infantile cuteness triggers feelings that disarms a gruff aggressive man then why not make use of it. Playing helpless is an old feminine ploy. As for foreheads, it's been pointed out that many female hairstyles give the appearance of heightening the top of the head. And this may mimic the child cuteness factor. It's interesting that older women usually decide to abandon the center parted, brushed down hairstyles of their youth for something poofier. As far as cartoon character sexuality, I have to mention Jessica Rabbit who does have the combed down hair, and really doesn't show any childlike features. But then the feelings she stirs in the male audience don't seem to involve protective and nurturing behavior either.